Turn the whole room into an interactive fitness system. We’re excited to introduce this interactive fitness product that won’t only get the job done, but your clients will have fun working out. What’s better than sweating and smiling? The Pavigym Combo 3.0 is an intelligent and interactive floor with integrated LED lights controlled by touch screen software, enabling trainers to design and track their training sessions. Basically, you can’t find another fitness product that will help your clients enjoy coming to your fitness facility. They can even control the lights and music at the touch of a button. It is a fun and entertaining way to train or to just get a great workout in. Keep your members sweating and having a good time at the same time! 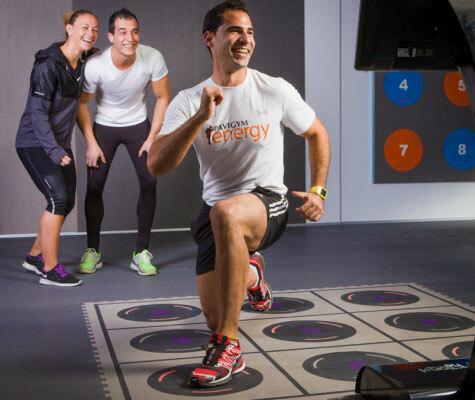 Pavigym Combo 3.0 stimulates user attention and increases intensity, by combining Square 3.0 and Vertical 3.0. If you’re interested in learning more about this fitness product, then contact us today. We can help you learn more about how the Pavigym Combo 3.0 can increase your target audience and ensure they have a good time no matter the age or fitness level. Vertical 3.0 will open a new training dimension for users! It interacts with members in a totally different, innovative and fun way by using symbols and lights on the wall. Members can register their progress through an unlimited number of interactive exercises. Combine Vertical 3.0 with other 3.0 products and make your member’s experience amazing!